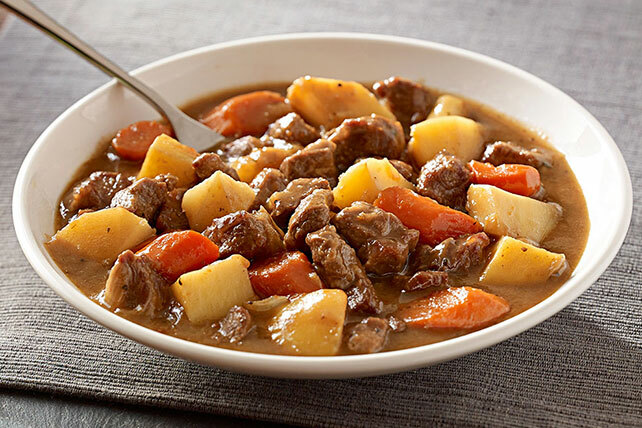 Celebrate St. Patrick's Day with this Irish Lamb Stew. Tender lamb, beef broth and chunks of vegetables make this Irish Lamb Stew one hearty dish. Please use alcohol responsibly, Blue Point® Toasted Lager is a registered trademark of Anheuser-Busch, Inc.
Heat 1 Tbsp. oil in Dutch oven or large deep skillet on medium-high heat. Coat meat with flour. Add in batches to pan; cook until evenly browned, stirring occasionally and adding remaining oil as needed. Remove meat from pan; set aside. Add onions to pan; cook and stir 2 min. Stir beer, broth and dressing mix into onions in saucepan. Return meat to pan. Bring to boil, stirring occasionally. Cover; simmer on medium-low heat 30 min. Add vegetables to pan; stir. Simmer, covered, 30 min. Uncover; simmer 15 min. or until meat is done, vegetables are tender and sauce is thickened, stirring occasionally. Substitute boneless leg of lamb for the lamb shoulder.